The Labour leadership contest is proving much more interesting than anyone expected. The script intended by the party establishment is pretty clear. They were expecting a re-run of the 2010 vote: The token left-wing candidate is destroyed, and a more centrist former cabinet minister prevails. They thought Corbyn would crash and burn, and Burnham or Cooper (or maybe Kendall) would steer the party on a cautious, business-friendly path to the next election. But the electorate hasn't read their script, and the left-winger Jeremy Corbyn has become the favourite to win. 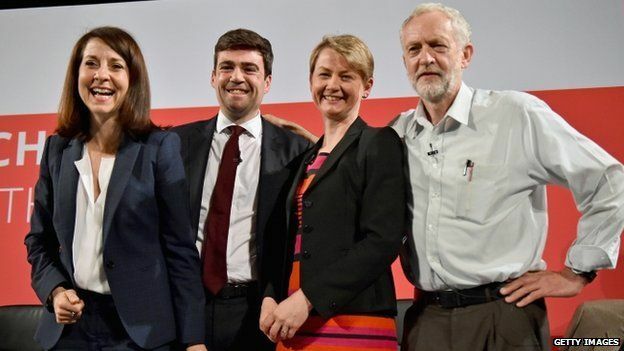 Left to right: Kendall, Burnham, Cooper, Corbyn. Under the new selection process introduced by Ed Miliband, MPs nominate a shortlist of candidates. The final result is determined by a wider electorate, consisting of full party members, affiliated members in trade unions, and people who have become registered supporters by paying a fee of £3. The final round uses an alternative vote to rank the candidates by order of preference. If no candidate obtains more than 50% of votes, the lowest-place candidate is eliminated, with his or her second-preference votes redistributed among the remaining candidates, and so on until one candidate has a majority. Corbyn has been lifted by a surge of new voters, both party members who have joined since the last general election, and registered supporters. Many of his supporters are younger voters. He travels the country giving speeches to halls packed with cheering crowds, a level of excitement his rivals can only dream of. The party establishment is shocked and alarmed that he might actually win. Grandees such as Tony Blair and Gordon Brown have stepped in to warn against voting for Corbyn. The Labour establishment are paying the price for at least twenty years of cautious, calculating politics. They fear only one thing more than offending the swing voters of middle England, and that is being off message. The message is expressed in vague, abstract language, calibrated to have as little meaning as possible, and glistens with insincerity. Ed Miliband was a particularly bad offender. He once repeated the same answer six times in a single interview. Instead of denouncing greed and theft, he burbled about the difference between predators and producers. He gave us a cringeworthy "hell yes, I'm tough enough" in his pre-election interview with Jeremy Paxman. Miliband didn't look tough enough to intimidate a toddler. As if that wasn't enough, Miliband had some pledges devoid of meaningful content carved onto a big lump of rock. (Labour should be grateful that for a few days, the birth of a royal baby displaced their stupid rock from the headlines.) A strong economic foundation? Great idea, Ed. That will set you apart from all those parties campaigning for a weak economic foundation. 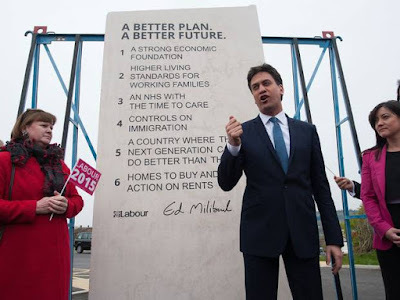 Ed Miliband and his infamous pledge stone. The grassroots are hungry for some righteous anger, expressed with conviction and in plain language. That is exactly what Corbyn gives them. The Conservative government is more than deserving of Corbyn's fury. The Tories delight in attacking the poor and vulnerable, and shovelling more money towards those who are already rich. If anything, they have become even more sadistic than they were in Thatcher's era. If I attended a Corbyn speech, I would be applauding with everyone else. However, I fear the Labour establishment may have a point. I may be showing my decline into middle age, but there it is. Youth, enthusiasm, and cheering crowds are great, but by themselves, they are not enough to win a national vote. The Scottish independence referendum is a vivid example. 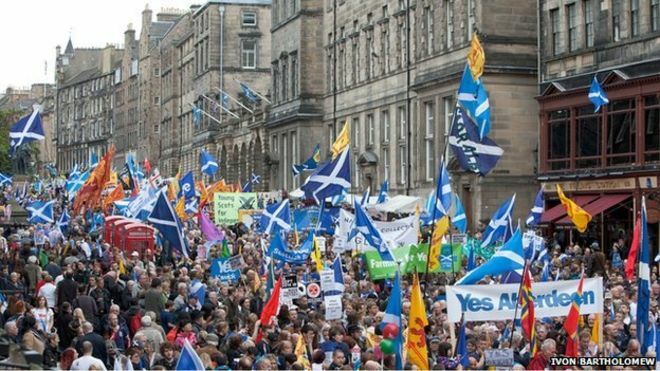 The Yes side had enthusiastic crowds, massive rallies, and idealistic young people; it had hope, dreams, music, and poetry; it had tweets, blogs, flags, banners, and razzmatazz. On referendum day, the No side had 380,000 more votes. Yes campaign rally in Edinburgh, September 2013. Political movements do not live in isolation. Actions produce reactions. It's great to inspire more people to come out and support you; but if it looks like you might win, that produces an equal and opposite motivation for your opponents to turn out. It's not enough to enthuse the faithful; you need to do it without scaring everyone else. It's a difficult trick to pull off, and it's not clear whether Corbyn even wants to. Moderation is not one of his notable qualities. There are parallels between the Corbyn phenomenon and the 2001 Conservative leadership contest. Then as now, the party in question was trying out a new system, with a grassroots vote to choose between finalists selected by MPs. In 2001, conventional wisdom predicted a final round between two former cabinet ministers, Kenneth Clarke and Michael Portillo. Instead, the backbencher Iain Duncan Smith shocked the cognoscenti by beating Portillo into the final round, then defeating Clarke for the leadership. Iain Duncan Smith, known as IDS, was a sort of mirror image of Corbyn. He was a backbencher who had stayed true to his principles -- in his case, anti-Europeanism and the other totems of hard-right Conservatism. He had made a name for himself by repeatedly rebelling against his party's leadership. He drew his support from disgruntled grassroots members, who thought Clarke was too ready to compromise with the enemy. Being elderly Tories, his fans were not the sort to stage wild rallies, but otherwise the parallels are striking. IDS' triumph was short-lived. He failed to exert authority over his party, was mercilessly mocked in the media, and faced dismal ratings in the opinion polls. After two years, the Tories had had enough and replaced him with Michael Howard. I find Corbyn's principles a lot more congenial than those of IDS. (I have previously expressed my scorn for IDS, who is now Work and Pensions Secretary.) However, Corbyn may be no more successful at persuading his party or the country to follow him. Maybe Corbyn will fall short of winning the leadership. At the very least, he has given the party establishment a much-needed scare. If another candidate wins, the victor would be wise to heed the anger and frustration that Corbyn represents. This appears to be happening already, with Burnham talking about the need to reach out to Corbyn and his supporters. If Corbyn does win, he will face a huge challenge to establish himself as a credible Prime Minister in waiting. Principles will not be enough; he will also need to be imaginative, flexible and inclusive. I wish the next Labour leader the best of luck; he or she will most certainly need it. The UK needs an effective opposition party, one capable of winning in 2020. It is bad enough that under David Cameron, we face five years of vandalism to the UK's laws, public services, and standing in the world. A further five years of rule by the next Tory leader would be a disaster, and Labour is the only party in a position to stop it. At times, the SNP has been portrayed in the London press as some sort of Trotskyist revolutionary party. This is very far from the case. The SNP seeks not to overthrow the establishment, but to become it; its policies are notably moderate and friendly to the Scottish business community.